With so many people now using their mobile phones and tablets to visit websites and to shop online, a website needs to look great and function on any size screen. * 1n 2012 over 50% of all local searches were performed on mobile devices. A responsive website is one that responds to the size of the screen you are using to look at it. If you are looking at it on the PC then it is shown in it’s fullsize glory. View it on a mobile device and you get a website that fits neatly to a smaller screen, the logo looks great and doesn’t dominate the whole screen and the images and text fit neatly with no scrolling or moving them about to see them. In short, the website looks great no matter if the visitor is viewing it on an ipad, tablet, mini, iphone or laptop. 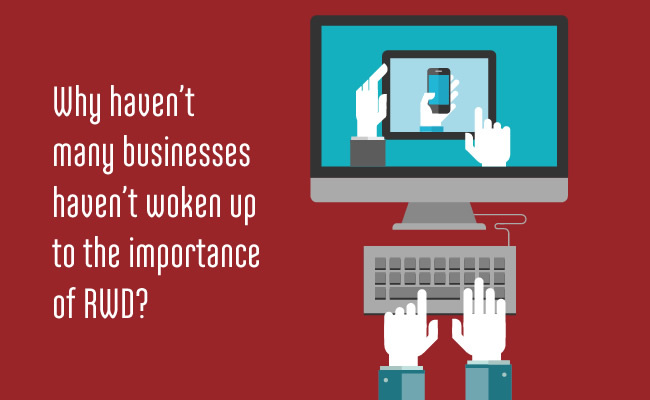 There are two main ways for achieving responsiveness: either responsive web design or with a mobile design. Responsive Web Design (RWD) This means that you have one website design that is tweaked for the different size screen. This is achieved in several ways, in the most effective and easily implemented method, all the styles are contained in one place and makes making changes fairly straightforward. Mobile Design (MD) this is where a whole new website is built that fits each different screen size. This is a more clunky method, takes more time in the long run and makes updating a pain. It involves creating a new website effectively, using a subdomain or new domain name entirely and each template is built for each specific device, not per screen size. Google is all about the visitor experience, and since most searches are done via Google, what they say means a lot. Pierre Farr from Google makes it clear that a responsive website pays dividends. Click here to see what he has to say about it. If your website is not tuned for mobile devices you can pay heavily. Even those website designs that do look ok on the smaller screen may not perform well – take too long to load, especially if there is a beautiful slider on the home page greeting your visitors, or you have to zoom in to read any of the information. A slow loading website can be the kiss of death, mobile users may be paying a lot to surf, and need to have the info they are looking for on their screens within seconds of clicking on a link. Many visitors click away before that weighty slider has even loaded (61%). 67% more visitors go on to buy products and services from a positive experience – well worth the effort of making your website easily viewed and navigated from any mobile device. With 55% of social media taking place on a mobile device you will be sure to notice the hard work and time you are spending on increasing the numbers of visits to websites from your posts and tweets. With a website that is not mobile friendly your audience will quickly become frustrated and a high bounce rate will ensue. This is not the way to a positive experience from your audience and you will unlikely get conversions. With the advent of Google Glass and smart watches, the screen sizes look set to vary all the more. A RWD ensures that your website will be ready for them when they get here. So take the future by the horns and show it no mercy, your website should be ready for anything. Checkout your website in this page speed calculator – they also offer suggestions on how to further improve your website, such as minifying the code, speeding up the server etc. The page speed calculator is also available through Google Analytics – and much more on just how your mobile unfriendly website could be affecting your visitor experience. Cheap website deals – worth the money? Search engine optimisation – white hat or black hat? © 2019 Red Card. All Rights Reserved. You can find out more about which cookies we are using and control the ones we use in settings. You can adjust some of your cookie settings by navigating the tabs on the left hand side. This website uses Google Analytics to collect information such as the number of visitors to the site, and the most popular pages.